The Word Biblical Commentary delivers the best in biblical scholarship, from the leading scholars of our day who share a commitment to Scripture as divine revelation. This series emphasizes a thorough analysis of textual, linguistic, structural, and theological evidence. The result is judicious and balanced insight into the meanings of the text in the framework of biblical theology. These widely acclaimed commentaries serve as exceptional resources for the professional theologian and instructor, the seminary or university student, the working minister, and everyone concerned with building theological understanding from a solid base of biblical scholarship. Overview of Commentary Organization Introduction-covers issues pertaining to the whole book, including context, date, authorship, composition, interpretive issues, purpose, and theology. Each section of the commentary includes: Pericope Bibliography-a helpful resource containing the most important works that pertain to each particular pericope.Translation-the author's own translation of the biblical text, reflecting the end result of exegesis and attending to Hebrew and Greek idiomatic usage of words, phrases, and tenses, yet in reasonably good English. Notes-the author's notes to the translation that address any textual variants, grammatical forms, syntactical constructions, basic meanings of words, and problems of translation. Form/Structure/Setting-a discussion of redaction, genre, sources, and tradition as they concern the origin of the pericope, its canonical form, and its relation to the biblical and extra-biblical contexts in order to illuminate the structure and character of the pericope. Rhetorical or compositional features important to understanding the passage are also introduced here. Comment-verse-by-verse interpretation of the text and dialogue with other interpreters, engaging with current opinion and scholarly research.Explanation-brings together all the results of the discussion in previous sections to expose the meaning and intention of the text at several levels: (1) within the context of the book itself; (2) its meaning in the OT or NT; (3) its place in the entire canon; (4) theological relevance to broader OT or NT issues. General Bibliography-occurring at the end of each volume, this extensive bibliographycontains all sources used anywhere in the commentary. 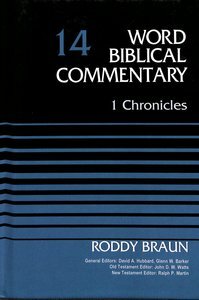 About "1 Chronicles (Word Biblical Commentary Series)"
Braun is an ordained Lutheran minister who holds the degree of Doctor of Theology from Concordia Seminary, St. Louis, MO. He taught Hebrew and Old Testament theology at Concordia Senior College, Fort Wayne, IN for 17 years and served as pastor of Our Savior Lutheran Church, Arlington, Virginia for 20 years.